On behalf of the Stiftung Umwelt und Entwicklung Nordrhein-Westfalen (SUE), the State Government of North Rhine-Westphalia and the Gesellschaft für Internationale Zusammenarbeit (GIZ), BICC carried out a study on „Migration—Integration—Development. African migrant organizations in North Rhine-Westphalia” (in German). 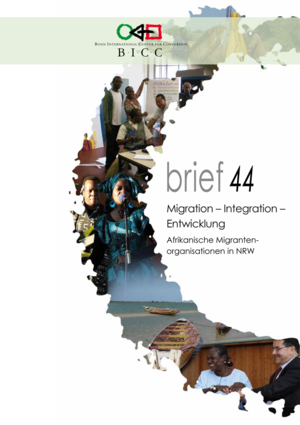 The resulting publication, BICC brief 44, helps to better understand organizational forms and purposes in African migrant organizations and their potential in development and integration as well as conditions under which such potential can be tapped.